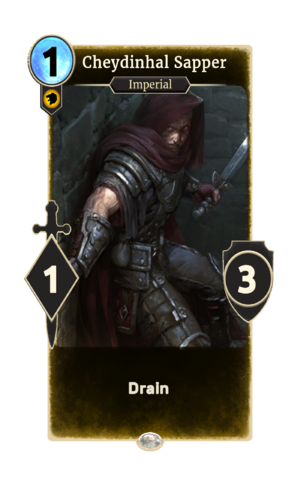 Cheydinhal Sapper is a common Willpower creature card. It is part of the Core Set. In addition to the card's availability in the Core Set, three copies are included in the Imperial Might deck. "We are ready for anything." "We walk as a lion amongst sheep." The card is named for the Cyrodiil city of Cheydinhal, which first appeared in Oblivion, and later reappeared in ESO. This page was last modified on 15 February 2019, at 11:51.